Hi there, my darlings! So I'm currently on Mid-winter Break (I work at a school) and boy, as awesome as it is not to have to get up and go out into this awful cold, it has also completely thrown off my posting schedule! Being home immediately makes me go back to my night owl/vampire tendencies and when I want to share, most of the Western Hemisphere is fast asleep! Hence, these evening posts rather than my usual mid-afternoon posts! 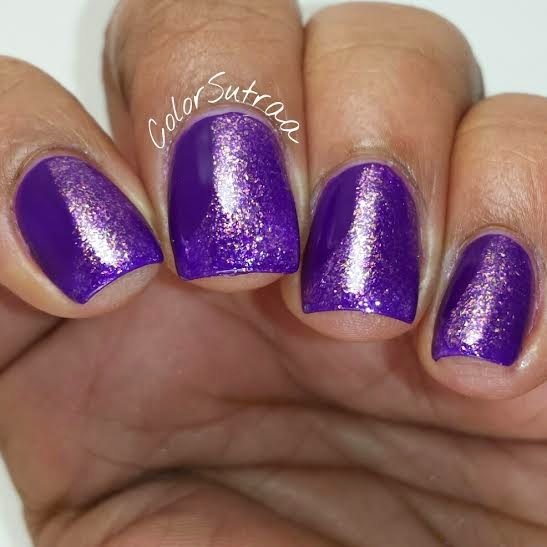 Anyways...tonight, I'd like to share with you Leesha's Lacquer's Valentine's Day 2015 trio! 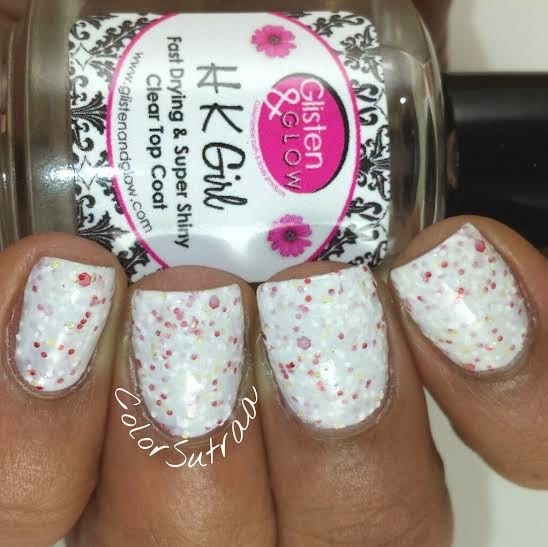 First, Cupid's Arrow is a sweet white crelly with small red and yellow glitters. Opaque in two coats, I had no trouble with formula or application. 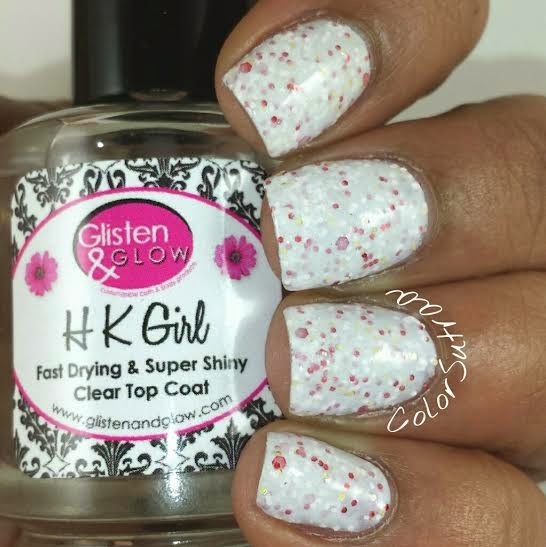 The swatches below show 2 coats topped with 1 generous coat of Glisten & Glow's HK Girl topcoat. So delicate and pretty! Next is the gorgeous flakie topper Cherub's Kiss. This applied so smoothly and easily and the swatches below show 2 thin coats casually side swept over Orly Saturated, topped with 1 thin coat ofGlisten & Glow's HK Girl topcoat. I absolutely LOVE this one and how this look turned out! And then, I decided to top it with 1 coat of Butter London's Matte Finish topcoat. And I love how it looks matte too! You decide : glossy or matte. Which is your favorite?! 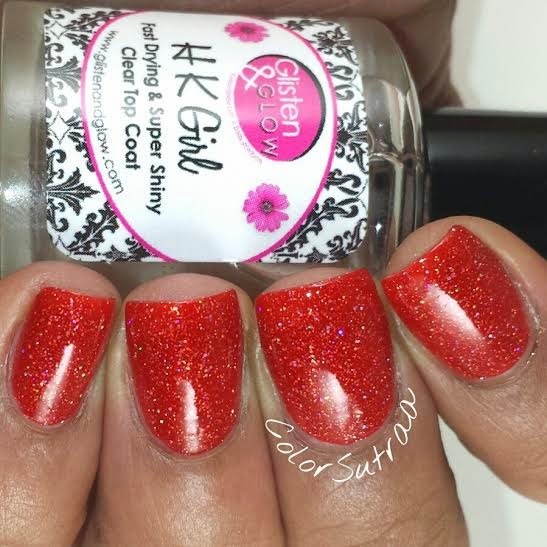 Last but definitely not the least is my favorite of the trio, Sweet Passion--a fiery red-orange jelly with holographic microglitter. 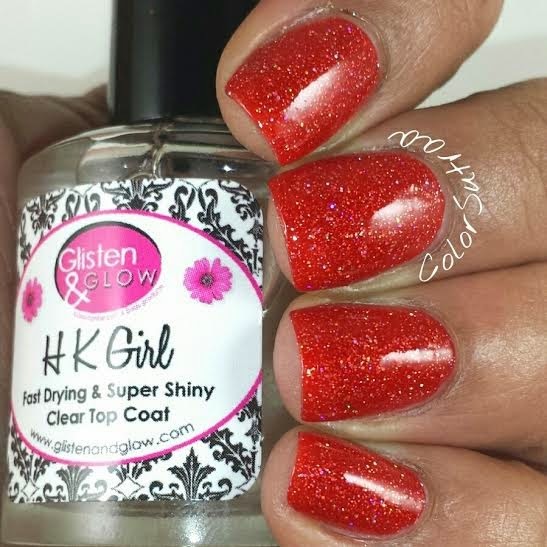 The swatches below show just 2 easy coats, topped with 1 thin coat of Glisten & Glow's HK Girl topcoat. SO gorgeous! And I loved this one so much I had to use it in a little bit of Valentine's Day nail art. 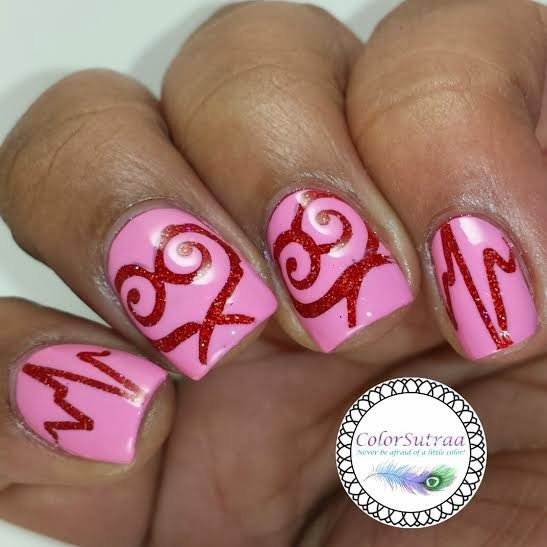 This look was created using Swirl and Heartbeat stencils from Twinkled T and Barielle Pink Parasol! So there you have it, my darlings! If you would like to pick up one of these beauties to add to your stash, or check out what others she has in store, you can find them at Leesha's Lacquers' Etsy shop HERE--prices vary from $3.50 for a mini, 5 mL bottle to $7.00 for a full-size, 12 mL bottle. 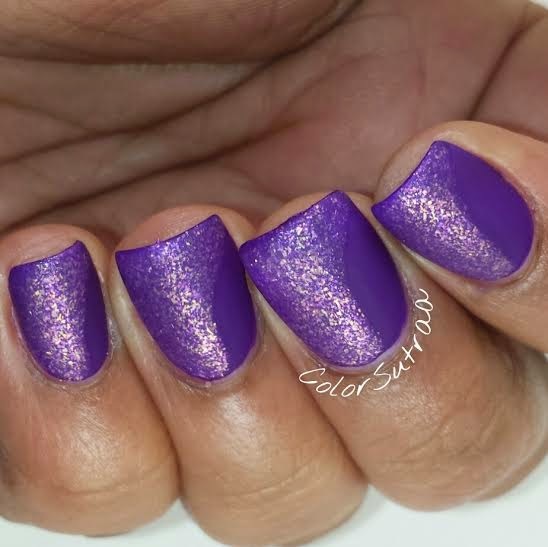 Don't forget to follow Leesha's Lacquer on FACEBOOK and INSTAGRAM for all the latest updates!